There were a number of philanthropic organisations coming into being from 1860 onwards, set up in reaction to the squalid conditions many of the working classes experienced in areas such as Bethnal Green’s notorious Jago (now the Boundary Estate). The Improved Industrial Dwellings Company started in 1863 by constructing the Langbourn Buildings in Mark Street, Finsbury (now demolished). Other than the Waterlow Estate other notable developments include the Leopold Buildings on the corner of Columbia and Hackney Road and Clarendon Flats in Mayfair. The company lasted until the 1960s by which point they owned around 6000 tenements in and around London. 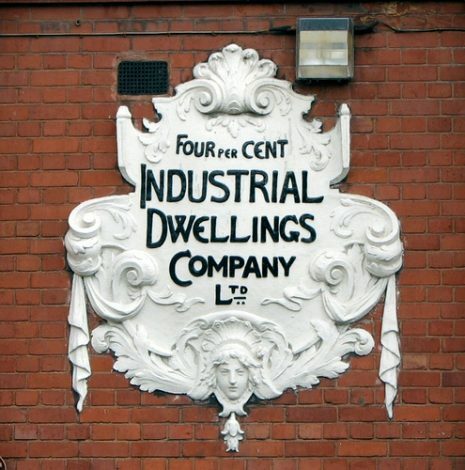 The IIDC operated on a freemarket basis, although the profits were limited to 5%, the rest of the money being reinvesting into further properties and developments. Waterlow also encouraged investment from others, unlike Peabody who seemed to fashion a legacy for himself as much as he wanted to help the poor. Workhouses – A site about the various Victorian philanthropic organisations.